We were delighted when Jessica @SolutionsBridal invited us to be a part of the Jim Hjelm bridesmaid dress trunk show. Their dresses are simply fabulous and there are so many styles that can easily be worn again without looking too "bridesmaidy". They've still got plenty of styles that are bridesmaidy & absolutely gorgeous. Check out some of the dresses and the lovely ladies of Solutions Bridal. The skilled staff helped brides and their discerning moms and bridal attendants narrow down the choices. Of course, Solutions - a Gainesville Bridal Boutique has gorgeous bridal gowns out the wazoo in all kinds of styles. Accessories and shoes to the delight of the brides. A lot of brides came in to try on wedding gowns or have their mom or attendants try on some of the fabulous Jim Hjelm dresses. We even got to see a bride find *her* dress. Oh and the shoes. Dang Gina, if they don't have some HOT shoes there. We had a great time and have a lot more photos from that day. If you were a bride who came in, email us and we'll send you a few pics from the day. Cheers! Keep your eye out for some lovely shots of Kari, one of the consultants who modeled a Jim Hjelm dress & has such a knack for looking hot in photos. LOVE this inspiration board by Lucky Designs. Purple is such a gorgeous color but you rarely see it for weddings outside of it's lighter lilac and lavender shades. 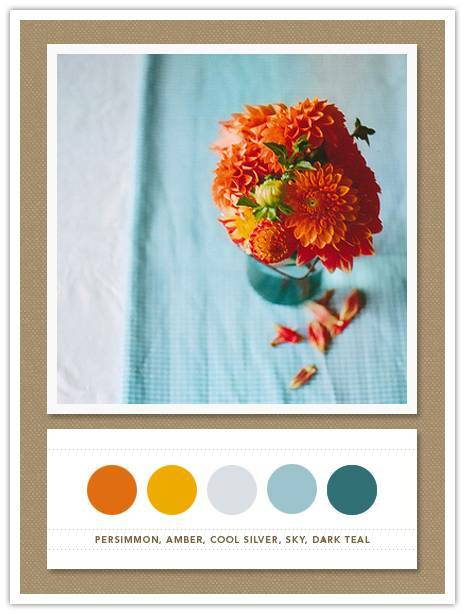 I'm ready to see it bold and paired with some yummy fall oranges and creams. A few times this year I've gotten the opportunity to assist/second shoot with a couple of great photographers, Karlin Connell and Mary Beth Tyson. Besides being awesome photographers with FABULOUS brides, they're pretty fun to work with and learn from. So here's a few of the photos I've caught while working with Karlin a couple of weeks back in Indiantown. This kid was focused on me the whole way walking towards the aisle! I love Florida outdoor weddings! So much life and light! Karlin got an AMAZING shot of this scene (on her blog), so I put my spin on it from one side. The horses were so pretty, but later one tried to lick my head (without permission). These two were really enjoying their day and I was glad to be a small part of it. This guy was my kinda people. Just sayin...he rocked the party! Anyhow, I loved working with those two and look forward to more collaborations in 2010! Remember the bump? Well, Jill traded her bump for a beautiful baby boy named Vander Ellis! LOVE that naaaaaame! Here he is six and a half days old with mommy, daddy, and aunt Ange! Aunt Ange is a baby hummer. :-) She calmed Van right down. Momma Jill lulling the baby. What a sweet smile! This was as he fell asleep. It was so adorable. Nothing cute than a puckered up baby mouth. More of Autumn & Adam's awesome outdoor wedding! It's reception time! every guest got an adorable crocheted flower favor PLUS chocolate covered espresso beans. yum! that's a man who knows how to dip his woman. there were SO many adorable children at this wedding. breakin' it down, married style. what! after a while, the dancing queen arrived and entertained us until she passed the boa on to the bride, who wore it fabulously and delighted her nephew. thriller. last laugh. nuff said. and that's that! hope you enjoyed & hit me up with your comments! Yahoo! So, we're making headway in the editing, and couldn't wait to share some gorgeous photos from Autumn & Adam's wedding held at Autumn's family home in Interlachen, FL. They had wonderful help from precious family and friends with an amazing eye for detail, creativity, and how to make people feel at home. first, here is a pic of the table decor in progress. check out the hearted pumpkin and the crocheted flowers. how flippin' sweet is that? magnolias are so fuzzy and soft - love the "budding" symbolism too. Autumn's family is so.... family! This image embodies how they feel to me. First looks are for lovers. Paxico Via Mexico did the music and boy was it something. i felt right at home with their lilting tunes. David grabbed this as Autumn whooshed by in all her glory on the arms of her mom and dad. have you ever seen a bride so happy to see her man? this was SUCH a moving ceremony. the whole bridal party surrounded them and covered them in prayer and blessing during communion. Do you think their children will have curly hair?